Rasmussen Reports (12/24/07): New polling data released today shows that John McCain has opened up a six-point lead over Hillary Clinton in the race for the White House. At the same time, the former First Lady leads Mike Huckabee by four. Hillary Clinton and Mitt Romney have the highest level of core opposition among the leading Presidential candidates--47% are poised to vote against each of them. At the opposition end of the spectrum, John McCain has the lowest level of core opposition. . . . The Rasmussen Reports daily Presidential Tracking Poll -- Likely Republican Primary voters nationwide for the Republican Presidential Nomination: Mike Huckabee 19%, Rudy Giuliani 16%, John McCain 15%, Mitt Romney 15%, Fred Thompson 11% and Ron Paul 6% (recent daily numbers). Republican voters viewed favorably: Thompson 67%, McCain 65%, Giuliani 65%, Huckabee 64%, Romney 59%. Among all voters, McCain has the highest favorability ratings of any candidate in either party—55%. He is viewed favorably by 43% of Democrats and 60% of those not affiliated with either major party (key stats for all Republican candidates). 74% of Republican voters view Giuliani as politically moderate or liberal. Most also see McCain in that light and a plurality see Romney as moderate or liberal. 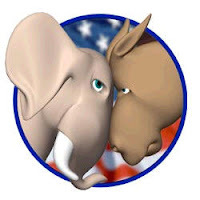 Tags: Democrat, Election 2008, presidential candidates, Rasmussen Poll, Rasmussen Reports, Republican To share or post to your site, click on "Post Link". Please mention / link to the ARRA News Service. Thanks!